Summary of today’s show: When a man is ordained a priest in the Archdiocese of Boston, he is made a promise that his medical, retirement, and other needs will be provided for now and in his elder years. The Christmas collection for the Clergy Funds is part of that promise keeping where the parishioners of the Archdiocese show their love and honor for the priests in their lives. Scot Landry and Fr. Chris O’Connor talk to Fr. 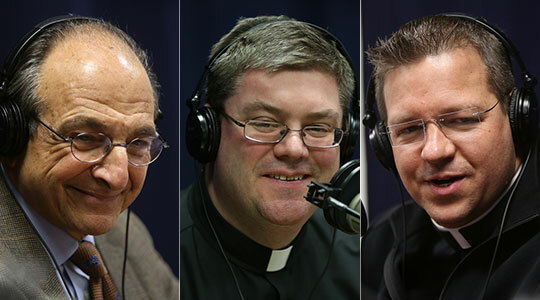 Michael Medas and Joe D’Arrigo about the Christmas collection and Clergy Funds, about the priests who’ve affected their lives, and the meaning of the priesthood as a vocation of spiritual fatherhood. 1st segment: Scot Landry welcomed Fr. Chris O’Connor to the show. They noted that the seminarians from St. John’s Seminary are taking their final exams and heading home for the holiday. Fr. Chris said he’ll be celebrating Mass for Christmas in three or four locations, including for the men at Norfolk State Prison. Scot said he just went to a going-away party for our colleague Anna Johnson who is taking a new job in Seward, Alaska. He said she’s one of the friendliest people in the Pastoral Center and has added a lot to our team. Anna and Karla take care of many of the behind-the-scenes aspects of the show. Scot said today we’ll talk to Joe D’Arrigo and Fr. Michael Medas about the Christmas day collection for the care of our retired and ailing priests. Fr. Chris said all the priests are grateful for the generous contributions people make for the care of their priests. 2nd segment: Scot said the theme of the show is “promises kept” because the Clergy Funds is in the business of keeping the promises made to our priests. Joe D’Arrigo said when a man becomes a priest he’s told that his medical needs, his housing needs, his retirement needs are taken care of. The Clergy Funds are responsible for the health and medical benefits for active and retired priests, stipends for retired priests, and Regina Cleri where 55 of our priests live with assisted care today. Joe said when a young man becomes a priests, he’s like other young men, not thinking about retirement or other factors later in life. Most men don’t start thinking about retirement until they hit about 60. Many of our priests are still active in their 70s and they start thinking about a transition to a life where they’re still active in the sacraments but they can slow down a bit. Clergy Funds makes sure they are taken care of. Many priests live on their own and Clergy Funds has a nurse who goes out to visit them. There are about 150 living on their own today, electing not to live at Regina Cleri. Fr. Michael Medas said about 303 priests are assigned to parish ministries. Beyond that there are priests in other ministries, like hospitals or the seminary. That makes up about 350. Another 350 are in retirement. However priests enter a life of service, so they don’t retire from ministry, but continue their service to the people of God. He can continue to live that life of service with the aid of the Clergy Funds. Generosity to the Clergy Funds directly impacts the lives of the people whose lives are touched by that priest. Every contribution allows ministry to continue to touch people’s lives. Scot said as we move forward in the Archdiocese, those senior priests will continue to be counted on as the number of active priests decline. Joe said the number of senior priests in ministry will exceed the number of active priests in a few years. The senior priests often allow the active priests to be able to take time off or to go to hospitals or prisons, allowing parishes to have coverage for Masses and other sacraments. Scot said they are senior priests because priesthood isn’t a job, like parenthood, it’s a vocation. Parents don’t retire from parenthood. Joe said he goes to Regina Cleri about once per week and every morning all the men are in the chapel at 8:30am celebrating Mass. It’s great to visit with them after they come out and you hear lots of great stories. Scot said every man in the pews is vested as a priest for Mass. Joe said there 2,800 years of priesthood at Regina Cleri. At the moment of consecration, you see the hands of every man move, even those who aren’t always coherent. It never leaves them. Those men are the history of the Archdiocese. Joe said Fr. Skip Jennings spent 46 years at St. Joseph in Somerville. He retired and went directly to Regina Cleri. He didn’t want to retire, but had a fall and needed to go for respite. He went to Regina Cleri and loved it and stayed. He was loved by his parish and the people love their priests. Joe said they hope for $4 million from the Christmas collection. They spent $6 million in medical benefits this year and $4 million in stipends this year. Scot said the Clergy Funds has tried to focus on the individual priests in our lives, to personalize the collection so that we can each honor the priests in our lives. Most of us had multiple priests who have impacted our lives. Joe said they often don’t know they’re having an impact on us. Joe talked about the priests that have affected him. He said his wife became ill about 20 years ago and they needed the last rites for her. They called a particular priest who came in about 15 minutes in the middle of the night. There was no question that he would come. Priests touch your heart on a daily basis for many of us. Even for those who don’t go to Mass on a regular basis, when they need someone, they are there. Joe said after the events of last Friday, people have turned to their priests. Scot said his own pastor said how proud he was of the pastor in Newtown, Connecticut, Msgr. Bob Weiss, who rose to the occasion. The loving representation of God in the person of the priest shows how priests can affect our lives on the toughest days of our lives. Joe said that could be any one of our priests in this Archdiocese on any given day. Fr. Chris said as he watched the footage and on that first night he wondered where was the Church, and it came out that Msgr. Weiss was with those parents receiving the terrible news. Fr. Chris said in the Boston Globe this week was a front-page story about Fr. Doc Conway in Dorchester, walking the streets, bringing Christ to the people of his neighborhood, both parishioners and not. Fr. Michael said he was inspired by Fr. Henry Ronan. You could see his love for God, as his face reflected his love for Christ. He was so unassuming, yet so faithful to God. He was full of joy and you could see he loved being a priest, because he was rooted in service. Fr. Michael said he is very much aware that it is the people of the archdiocese who value the service and sacrifice of their priests. Fr. Chris said Fr. Dan Dunn at St. Mary’s in Dorchester as a senior priest affected him. He was a gentle, humble soul. He remembers Fr. Haley in Holliston who had dinners for all the priests of the area to foster camaraderie. He remembers that Fr. Haley had battles with the people of the parish but yet at his parish they all expressed their love for him and Fr. Chris realized that it was just like a father and his children who sometimes disagree but that there was still love. Scot said growing up he worked in the rectory of St. Michael’s in Lowell for six years. Fr. Paul Bailey was like a second father to him. Fr. Paul Sullivan spent time with Scot and his brother on the tennis courts. Fr. Lenny O’Malley worked with a lot of the teens while they were there and gave him great advice. Fr. John Mendicoa taught him how to love to eat. The native of Spain cooked a feast every Tuesday for the Bingo crew. Fr. Charlie Higgins who is now in Newton was a deacon there and gave Scot and his brother Roger invaluable advice as they prepared to go to college. 3rd segment: Scot said to promote this Christmas collection, the Clergy Funds team put together a video about the life of Fr. Skip Jennings. Joe said his reflection on his life as an active priest, what it meant for him, and his astonishment upon his retirement how his parishioners related to him were compelling. Our priests don’t realize how much they are loved. At the annual Celebration of the Priesthood dinner brings out 1,400 people. One thousand people write personal notes to their priests. When he has shown the video to priests, every priest takes the story to heart as their own story. Fr. Michael said he heard from Fr. Skip’s story how he had become family to the parish, not in some abstract way, but in a concrete way. Because he is a priest, they invite him in where outsiders aren’t usually welcome. Priests are blessed and honored to be brought int o the family circle. Every priest wants to become a good spiritual father. Fr. Chris said he’s been living at Sacred Heart in East Boston and St. John’s in Winthrop for up to eight years and he knows them and they know him. Christ is the common denominator, using His priests to communicate His love. It hit him profoundly when Fr. Jennings said there was no other life possible for him because it was the Lord’s calling for him. Scot said Fr. Jennings was blessed to serve 46 years in one place, but how difficult it must be for other priests to receive that call that they are to leave the people they know and love to minister to a new parish. He’s heard from priests how difficult it is to be sent somewhere else, but it’s part of being a priest. They are always being sent and they serve the people of God wherever the bishop wants them to go. Fr. Michael said the life of a priest is not to be a member of one family, but to serve all. They are called to bring that life of grace through service to many places. Joe said Clergy Funds today has expenses today of about $15 million for health, dental, stipends, disability, housing and more. $4 million is about one quarter of what they need to remain stable and the Funds are stable. Scot pointed out that the numbers of priests in need at advanced ages are increasing. It takes all of us to be even more generous than we’ve been just five years ago. Joe said it’s an increasing challenge. Joe said a 4 percent increase each year in the collection will allow them to remain stable. They have three collections per year plus the Celebration of the Priesthood dinner to provide support for our priests. Fr. Michael talked about how hard it is for priests to ask for people to be generous to themselves. But it is easier to ask them to provide for those priests who are retired now. Scot said it’s been since 1972 that the Christmas collection has gone to the Clergy Funds as a matter of equity. Previously the Christmas collection stayed in the parish for those priests, but those in wealthier parishes did better than those in poorer parishes. Joe said the driving principle in the Clergy Funds is to treat all the priests on an equal basis. Scot said people often give the same amount to each special collection that comes up, but now people may want to be a little more generous to this collection. Fr. Chris said the priests do rely on people’s generosity and costs for care are increasing. Fr. Michael said Christmas is about the gift of Christ to us. If you need more peace in your life or know someone who does, come to Christmas Mass to receive peace and joy. The envelopes will be in churches this weekend to be brought back on Christmas. People can also donate online. He said people should bring the envelope home and think about what priests have meant in their lives.